The Touch Wizard Pinball is the ultimate multi-media machine, thanks to the Android operating system. This machine created by Arcooda allows users to access to thousands of apps and games through the Google Play Store. This allows for music, movies and of course games to be used on the touch wizard. This is the joystick model. As expected from Arcooda, the Touch Wizard is a versatile machine. Users can use any app available on Google Play thanks to the 19 inch HD LCD Touchscreen Monitor, the high quality joystick and buttons or connect any console controller thanks to the USB ports built in. Also included are Pinball Push buttons on the side of the cabinet so you can play your favorite pinball games (please note, to play with true pinball experience, please consider the Touch Wizard Pinball Edition machine with shaker motors, flipper coils and more). Arcooda's patent pending hardware also allows you to plug and play any of your favorite consoles or your PC. Easy to use switches allows the user to easily switch between your favorite ways to play. Supports virtually all late model consoles, just plug in your XBOX One or PlayStation 4 and start playing the current games such as Tekken 7 with easy. Just like being in an arcade centre. Supports almost all console controllers, play with Arcade Joystick, touchscreen or hand console controller (subject to game software support). The gaming choice is yours. Connect your Steam, XBOX Live, Playstation Plus, Origin, Google Play store, etc… accounts and have an “all-in-one” cabinet. Never get tired of the same games. Compact, the Touch Wizard game machine packs a punch. 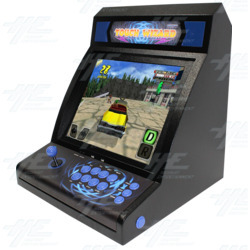 Get the most from your gaming experience from the Game Wizard arcade machine series.